Things get bad for all of us, almost continually, and what we do under the constant stress reveals who and what we are. A friend from California, spoke of terrible wild fires that raged several years ago very near his home. The fires left a massive swath of destruction behind them. The landscape was left eerily barren, much like the surface of the moon. But our friend mentioned something else, something he noticed after those fires that he had never really noticed much before. Out of the ashes, out of the void, out of the barren vista, there had sprouted an abundance of flowers. Brilliant reds and purples, magnificent colors, bright and intense, had begun to bloom, like they’ve never seemed to bloom before. Out of seeming death, had come life. Out of a bleak landscape, had come renewal – of a most spectacular kind. The fires in their destructive fury may have burned away much of what had been growing on the land. But the fires couldn’t destroy what lay beneath the surface there. In fact, the fires may have created the conditions for these magnificent flowers, with their incredible colors, to come to life so brightly. Our friend was stunned by what he saw, by what he had never noticed before – before the cancer that had entered his life, before the fires, before the threat all around him. But after his journey with disease and his experience from the fires he notices. He came through the fires and is safe. He came through the fires and his property and life were not destroyed. He came through those fires, as well as the threatening fires of cancer, and now sees life in a different, a much more appreciative way. I never paid attention before, he said. But now I do. I’m more alive now than I was before. Things are just clicking with me. I see beyond myself now, beyond the petty challenges if life. Now I see the bigger picture. Once you’ve been through any fire – cancer, loss, brokenness, life-altering challenges – you really can notice things that you never had noticed before. Most people think of wildfires as this horrible thing. But in fact, Yellowstone, and many other forests NEED wildfires to help reproduce and experience growth. Nature has a way of making it through some of the most horrible situations. He then went on to describe how there are these special pine cones which have a special coating to help them make it through wildfires in order to reproduce. Once the trees are burned, they drop these pine cones which are then able to start the reproduction process. 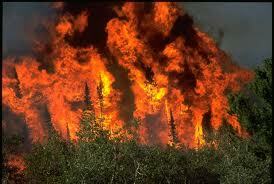 Pine trees, like human beings, have the ability to go through fires in order to become stronger and more fruitful. What do you notice because of the fires in your life? What is more brilliant to you? More clear? More understandable now? What is healthier? What has been enhanced? We hope that the fires have cleared the way for you to see something differently now, something better. Something more. The fires can temper us. The fires – the challenges, the intensity, the heat that comes with profound vulnerability – can help us to view our lives and the world around us in a brand new – and better – way. Ultimately, we hope that way can truly bring us a sense of wonder and beauty and gratitude and peace like we’ve never known them before. We know this personally to be true. Our own relationship was fostered and grown through several “fires” in each of our lives that burned inside and out. Because of certain losses, disappointments and messes, we met each other, and sharing in those fires with one another eventually gave birth to a deep, intimate friendship and, ultimately, this wonderful mission – Someone To Tell It To – that we are on together. Loved this blog. I can certainly attest to the reality of seeing what was previously unseen because of life’s challenges. My own experience with cancer, and now the reality of aging, has given me a greater passion for wanting to spend my life for the Lord – right up until its end. May those who have not yet come through the fires, be encouraged!